GARDAÍ HAVE RENEWED an appeal for missing person Deirdre Jacob. 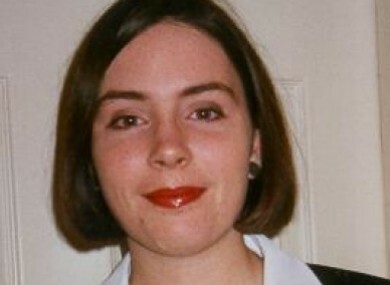 Now, on the 18th anniversary of her disappearance, gardaí are asking anyone with any information to come forward. When last seen, she had been wearing a navy v-neck t-shirt with a white trim on its collar and sleeves, navy or black straight jeans and blue Nike runners. In a statement issued today, gardaí have noted that this bag was never found, and want to hear from anyone who has ever found or noticed a bag similar to the one described. She is described as being 5′ 3” in height with a slim build, grey/ green eyes and dark chin length hair. Her parents made a renewed appeal for information about her in an episode of RTÉ’s Crimecall last year. Email “Gardaí renew appeal for missing person Deirdre Jacob ”. Feedback on “Gardaí renew appeal for missing person Deirdre Jacob ”.